We have live performances this Saturday lunchtime from Sexton Ming and Emily & the Faves. Renaissance man Sexton Ming is a painter, poet, musician and ‘keeper of the fire‘ for Outsider Music with his own Rim Records imprint. 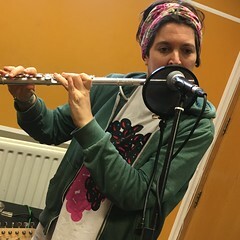 Sexton has been a regular guest on various programmes for Resonance FM over the years and is a particular favourite of the Hello GoodBye Show. He is about to celebrate his half century and has promised to drop by the studio with a handful of poems, a few exclusive tunes from his latest collaboration with Billy Childish plus all the details regarding his upcoming 50th Birthday Party!. Emily & the Faves have been whipping up a lot of interest in their native Merseyside with their bright and breezy psychedelic pop songs and now hope to take London by storm as they embark upon a series of gigs here in the capital. This entry was posted in Hello GoodBye Show: Listings Info and tagged dexter bentley, emily & the faves, hello goodbye, london, radio, resonance fm, sexton ming. Bookmark the permalink.